A new law passed this session will allow the Paynesville American Legion to use charitable gambling profits, from such operations as pull tabs and bingo, to either improve handicap accessibility or to replace an out-of-compliance facility with a new one that satisfies American Disabilities Act standards. 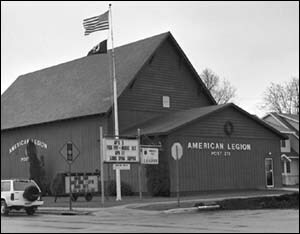 A provision authored by Rep. Doug Stang, R-Cold Spring, will help the Legion comply with the American Disabilities Act by using the money designated for remodeling for a new building. It was signed into law by Governor Arne Carlson as part of the Omnibus Gambling Bill. Joe Kremer, Paynesville American Legion Commander, said members of the local Legion appeared before House and Senate committees to lobby for and provide input on the bill. ãThis is a giant step forward,ä Kremer said. ãThe next step is to submit an application to use gambling funds for a new building to the gambling board for their approval. We wonât know until mid-May the results of this request,ä he added. The Paynesville American Legion is still hoping to build this summer. Once they receive approval from the gambling board, then letters containing a ballot will be sent out to the entire membership. ãWe need at least 60 percent of the ballots returned to have a majority vote,ä Kremer stressed. The proposed new building will be located between Alco and Country Inn on Highway 23, on the west edge of Paynesville. The new building is estimated to cost about $400,000. The Legion has $42,000 in the building fund and if the gambling board approves the application, that will give them another $89,000 to use toward the new building. The Legion can spend the same amount on the new building that it would cost to remodel the old building ($89,000), Kremer explained. ãThe Legion has 270 members and with the membership getting older, the need for a handicap accessible building is very necessary,ä Kremer added.